All of our 8 courts use the latest court technology, to provide a variety of playing surfaces for our members. Our fantastic grounds team have a regular court maintenance programme and work tirelessly to keep our courts in great condition, all year round. Our porous acrylic courts have a rubber granule top dressing, producing a medium paced, high bouncing court which takes spin well and allow players to slide. To maintain these fantastic courts, we ask that members drag the courts and 'clean' the lines after use. 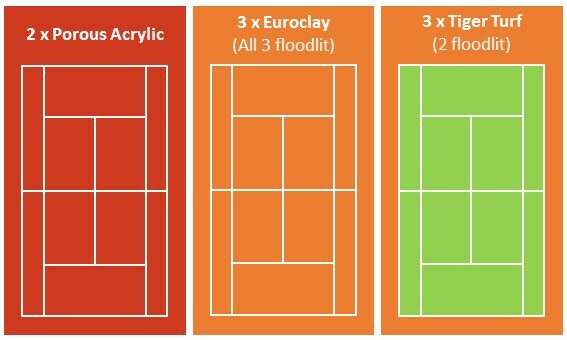 Our Euroclay artificial clay courts offer the same playing characteristics as natural clay such as ball bounce, slide and even appearance. The court has a medium pile surface dressed with sand which produces a medium to slow pace bounce. All 3 courts are floodlit. Just like our porous acrylic courts, members are asked to drag these courts and clean the lines after use. Our 3 TigerTurf artificial grass tennis court surfaces play consistently in all conditions and are our fastest surface. The design of these courts mean they are easier on your knees than traditional hard courts and so prove popular for this reason. Two of these courts are floodlit.